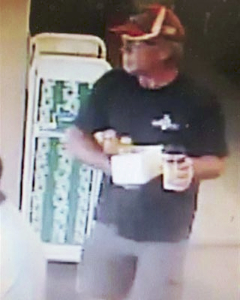 Hawaiʻi Island police are asking for the public’s help in identifying a man wanted for theft in Pāhoa. The incident took place in a market, where the 56-year-old victim briefly put his wallet down and an unknown man grabbed it. The man is described as Caucasian, possibly in his upper 50s, with a medium build. Police ask anyone with information on his identity or whereabouts to call the Police Department’s non-emergency line at 935-3311.